Before drawing eyes, there are some things you need to know first. Eyes are spheres just like a ball, hence the term eye ball. Draw your lines with a slight curve radiating out from the pupil. This also means that at the edges the eye ball should be slightly darker than the center. Eyes have a pupil. 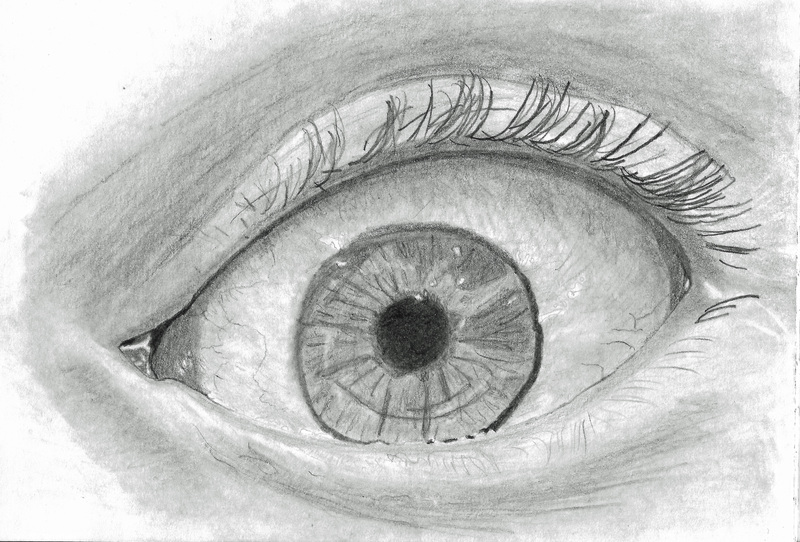 Even if you can’t see it in a photo, the viewer will find the eye incomplete without the pupil. Therefore, draw in a pupil. 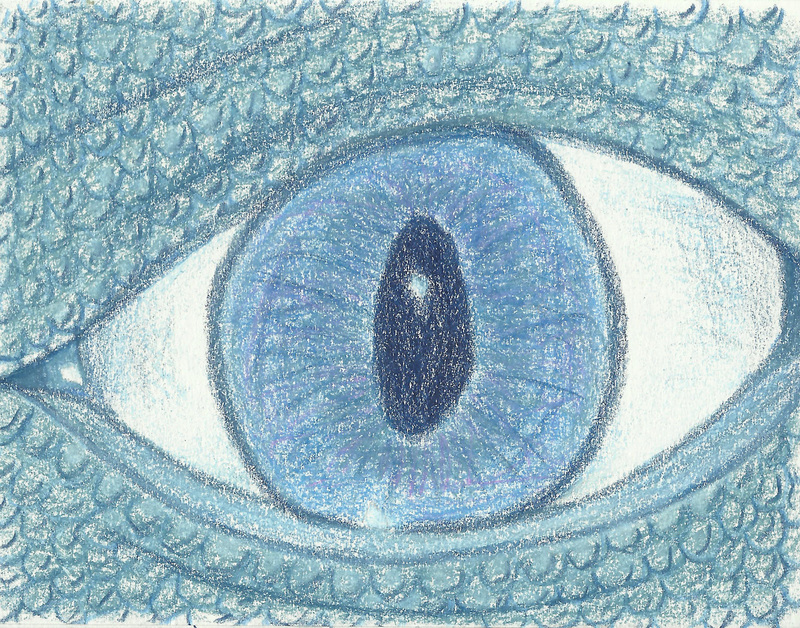 Pupils are different shapes depending on the creature you are drawing. Humans have circular pupils. Horses have rectangular pupils. Be observant and use google to findout what you don’t know. The pupil is the darkest part of the eye. Use your B pencils and build up to get the darkness needed. For colored pencils, use dark umber, tuscan red, indigo blue, and black raspberry or black grape. You could also use black ink. Eyes are moist. The moisture reflects light creating catchlights. To draw these, keep some of your paper free of graphite. Use your kneaded eraser to keep that small dot free. You can also use the Tombow Mono eraser to get the catchlight. Keep at least one completely white catchlight and then several more lighter ones. To make the lighter ones, use a 9H pencil or your tortillons with just the left over graphite. For colored pencils, you will want to use white, 10% french grey, 10% warm grey to create the catchlights. Eyes have eye lids. These cause a shadow over the top part of the eye ball. Make sure to draw that shadow. It should be a curved shadow because the eye is a sphere. For colored pencils, the shadow will need to be a darker version of the iris color and either a greyed lavender or one of your greys for the shadow over the white of the eye. At the very edge of the lid you could use dark umber or black raspberry. Eyelashes must be drawn for the eye to look complete. They come out from the edge of the lid and are curved. Draw them up and out. Use light marks at first and then a fine tipped soft pencil, 4B or higher. If using color, then use a burnt umber. Irises are unique. For graphite, you need to vary the values. A single straight value will not look realistic. Use fine, solid, curved lines from the pupil, then smudge them to blend. This will enable the varied values to show. With colored pencils, you will want many different shades of the color. A yellow owl’s eye may have lemon yellow, spanish orange, pale vermilion, cream, sand, and jasmine. Layer the lighter colors first and then move to the dark ones. Eye in colored pencils. Note the catchlights and the shadows. Notice the shadow under the lid and the white of the eye has minute details of lines. Achieve these with gentle lines of a pencil and then blend them outward. See how the iris has various values.